Chargebacks are a very common problem for merchants, especially in the case of Card-not-Present transactions where the identity of the cardholder cannot be verified physically in the presence of the merchant. To have a better understanding of the problem, we will take a look at some alarming chargeback statistics – and discover what merchants can do to reduce the number of disputes filed by customers for not recognizing their transactions. Chargebacks often result in incredibly high costs for the participants in the payment network. According to the Chargeback Triangle Report by Verifi, this problem incurs charges for merchants and issuers of over $31 billion per year globally. These costs aren’t evenly distributed either: in fact, two-thirds of them are usually assumed by merchants (around 19 billion), while only one-third is paid by card issuers (around 12 billion). The efficient management of chargeback disputes means that it will be the responsibility of the merchant to obtain the necessary documentation, including internal data and delivery records from third-parties. This translates to additional, unexpected expenditure for companies: according to Verifi, the cost for managing the chargeback process often exceeds the value of the disputed service or product. In fact, each disputed dollar incurs an additional $1.50 spent on fees for merchants and issuers. One of the most alarming chargeback statistics that have been concerning merchants during the last few years is the high percentage of cardholders that do not reach out to them in the case of unrecognized charge. Instead, 76% of them go directly to card issuers, making it difficult for merchants to try solving the problem and avoiding possible disputes. However, it is estimated that a chargeback could have been prevented in approximately 80% of the cases if the cardholder contacted the merchant first before filing a dispute to the card issuer. Transaction disputes are more common that one might think. 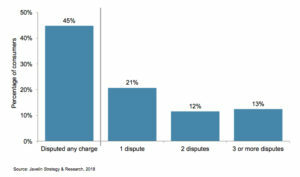 In fact, more than 45% of all customers have filed a dispute for an unrecognized charge on their credit card in the last year. In addition, approximately 25% have disputed more than 1 transaction, of which 13% made 3 or more disputes. Fortunately, many of these disputes were resolved before converting into a formal chargeback. Poor communication can also result in additional costs for merchants. While many transactions are disputed due to fraud suspicion, a surprising number of unrecognized charges actually come from unclear descriptors. Payment descriptors, also known as billing descriptors, make reference to the merchant information that appears on the customer´s bank statement. If a customer cannot effective link a charge to the company that sells the product or service, he could file a dispute with the card issuer. The possibility for disputes arose as a way to protect the customer as the more vulnerable part in a transaction. However, more than 53% of the card issuers and 72% of the merchants agree that it has become too easy for customers to file a dispute, which contributes to the growing percentage of friendly fraud – a case in which often legitimate transactions are disputed to avoid making a payment. As we just mentioned, friendly fraud can be really challenging for companies, especially in the case of Card-not-Present transactions where merchants do not meet their customers face-to-face. Approximately 43% of in-app purchases are associated with friendly fraud, which can be an indicator for either fraudulent transactions or legitimate purchases made by customers that want to avoid the payment. In any case, it is one of the most distressing chargeback statistics for digital merchants, and should be taken into account when applying security measures. According to Javelin Strategy & Research, the breakdown of overall chargeback costs goes as follows: for each dollar of a product’s value, $0.43 cents goes to management costs, $0.37 for chargeback fees, and $0.70 for labor costs. Despite the increasing number of chargebacks, a high percentage of online merchants do not keep track of customer purchasing behavior after a dispute. Considering the fact that a lot of disputes are a result of friendly fraud, it is important to monitor user behavior to avoid more chargebacks. Although costs for handling a chargeback often exceed the value of a product, a fast resolution of disputes is important for maintaining your reputation and your customers in the long run – even if this resolution is not in favor of the merchant. 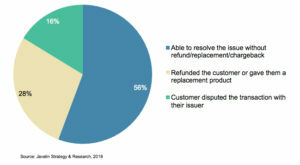 In fact, when disputes are resolved after the first call, 81% of the customers will not stop using the same credit card card, and 64% will continue shopping at the company despite the issue. Chargeback statistics: how can merchants reduce chargebacks? Unfortunately, there is no way to completely eradicate chargebacks from your company’s activity, but there are some efficient ways to reduce their number and damage. One of them is using a PCI-compliant Payment Gateway such as MYMOID, which gives merchants more control over their payment logic while encrypting and securely transferring cardholder data. To discover the rest, visit our post 10 ways to reduce chargebacks. Note: This article was made using chargeback statistics from the Chargeback Triangle Report by Verifi and Javelin Strategy & Research.